Thanksgiving, how do I love thee? Let me count the ways. Actually, let me not — at least not entirely. There are far too many. I love the crispness in the air (however subtle it may be down here in Florida) and the ubiquitous football games on every TV screen (even though I don’t care about, or even totally understand, the game). I love the way the house swells and bustles with family members I haven’t seen in far too long (even though after a day or two, I’m ready to stop explaining the current events of my professional and romantic lives to people who, essentially, remain strangers for most of the rest of the year). And, of course, I love the food: the ridiculous, magnificent spread of food we make way too much of, year after year. It’s not like we don’t learn. We know there will be leftovers. In fact, they’re one of the best parts of Thanksgiving! But even the most avid turkey sandwich enthusiast gets a little tired of them after a few days. Of course, “I’m sick of it” is no excuse to throw away perfectly good food. Goodness knows we have enough of a food waste problem in this country already. So before you’re tempted to toss the remains of your feast in the trash, check out these delicious and creative ways to reimagine your Thanksgiving leftovers. From classics like soup to surprisers like nachos, you’re sure to find something to reignite your holiday appetite. Although many of these dishes contain more than one traditional Thanksgiving ingredient, we’ve organized them by their main component so you can easily find a recipe that fits your unique leftovers situation. The main event is also the one most likely to leave a lot behind — no matter how insistent mom is that each guest take some home. 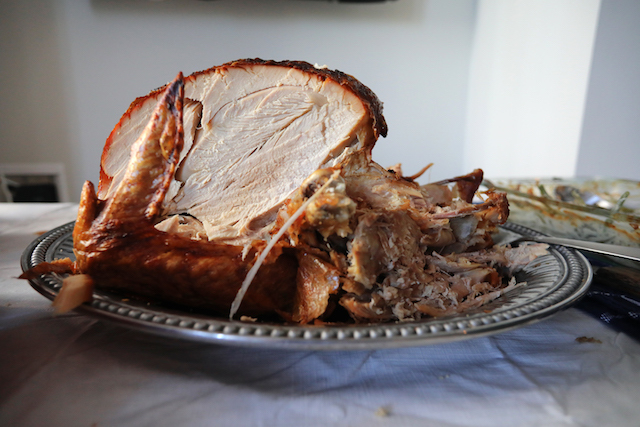 Here’s how to transform that pile of turkey meat into a delicious new dish. The day after Thanksgiving, a big, hearty meal might be the last thing on your mind. Lighten up your menu by making that leftover turkey into a salad — either the creamy, mayo-based kind you serve on bread, or the kind with actual lettuce. This cranberry pecan version from Carrie’s Experimental Kitchen looks lovely, and Self Proclaimed Foodie’s Krissy substitutes Greek yogurt instead of (or in addition to!) mayonnaise. 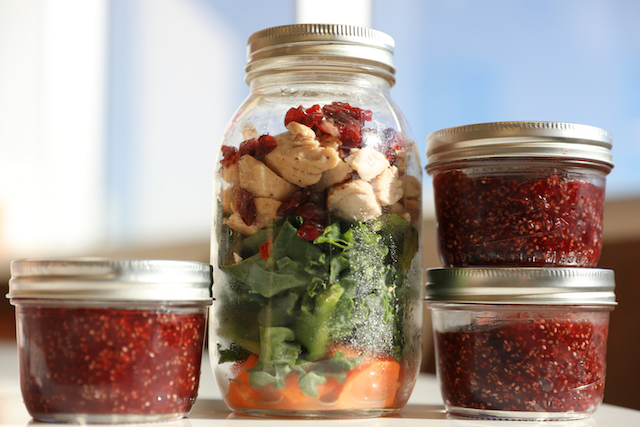 Our own office superhero, Jaimee Tyree, created a Thanksgiving mason jar salad with sweet potatoes, dried cranberries, turkey breast and kale to be eaten either hot or cold — a great option for a grab-and-go post-Thanksgiving lunch, especially if you still have to work on Friday. What’s eggy, delicious and perfectly appropriate for breakfast, lunch or dinner? If your answer was frittata, you speak my language — and if it wasn’t, prepare to learn about your new favorite food. But just like an omelette, the possibilities are endless. Just crack some eggs and put on your thinking cap! Now here’s a dish I’d never have thought up on my own. Food Network offers for your consideration this appetizing tray of Thanksgiving leftovers-laden nachos, including turkey, roasted Brussels sprouts and butternut squash. It even uses up the last of that can of French-fried onions you put on your green bean casserole. What’s a better mate for your leftover bird than mayonnaise? Try a creamy, cheesy mushroom sauce — complete with spaghetti. 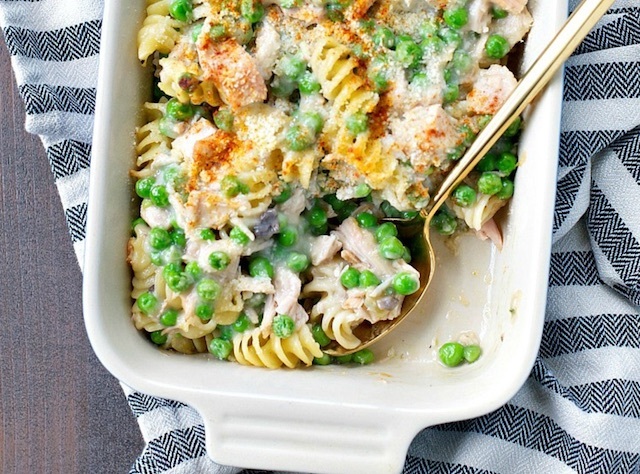 Tetrazzini, a classic American pasta dish, works well with all kinds of poultry and fish, and turkey is no exception. Plus, The Pioneer Woman’s version calls for an entire block of cream cheese. Want something a little bit lighter? Try this penne dish from Martha Stewart, which calls for kale, goat cheese, shallots and white wine. This fancy-sounding dish by Bobby Flay actually looks pretty darn easy to put together. And if you skip the pomegranate molasses, you probably already have most of these ingredients in your pantry. Sound unconventional? Sure — but the best part about making pizza at home is going beyond your local joint’s tired repertoire. 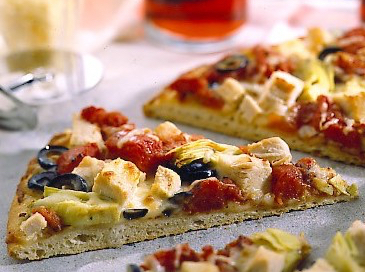 If you’re still unconvinced, check out ReadySetEat’s artichoke turkey pizza. Just grab a premade crust and add some diced tomatoes, canned artichokes and olives, and two types of cheese (because, yes). Repurpose an American classic into a Mexican dish that way predates the birth of our country. There are lots of recipes out there, but TPH senior editor Heather van der Hoop shares her father’s time-honored version, which the family makes year after year. First, create a delicious homemade enchilada sauce by pureeing the mild chili powder, fresh jalepenos, barbecue sauce, one quartered onion, one clove of garlic, the can of tomato sauce, the cumin, oregano and sugar, a teaspoon of salt, an eighth of a teaspoon of pepper and two tablespoons of cooking oil. Fry the mixture up in hot oil for about five minutes, stirring constantly. Then add the broth, a cup of half-and-half, plus the two tablespoons of cornstarch dissolved in an additional 4 tablespoons of half and half. Simmer for two minutes. Then, saute the remaining half onion and clove of garlic, diced finely, in hot oil. Add the shredded turkey, brown slightly, and stir in sauce (reserving some) and salt and pepper to taste. Heat, and keep warm. Fry the 12 tortillas quickly in hot oil. Drain and keep them warm in a casserole dish. Dip the tortillas in heated sauce, put a strip of filling across each, and roll tightly. Arrange side-by-side in pan, sprinkle with cheese and heat in a 350 degree oven for 10 minutes. Spoon heated sauce over enchiladas and serve with sour cream and chopped green onions. Muy bien! What better way to weather the cold winter months than with a hearty chili? And since you’ve likely got more turkey than you know what to do with, this lightened-up version from Ambitious Kitchen is a perfect fit. And if you’re feeling fiery, check out Food Network’s leftover turkey chili recipe, which brings the heat with fire-roasted tomatoes. Obviously, you need to put all those things together in one dish with mashed potatoes on top. Although it’s called “shepherd’s” pie because it traditionally comes with lamb, this dish — poulterer’s pie? — is as simple and cost-effective as it is tasty. You don’t have to use any ingredients other than the leftovers themselves. TPH editor Caitlin Constantine made individual servings with her Thanksgiving leftovers last year “by layering turkey and stuffing and gravy in ramekins, then putting mashed potatoes on top and baking them until the taters were golden.” Um, yum. And if you want a full-sized pie, check out Martha Stewart’s recipe, which sweetens the deal with leftover cranberry sauce and glazed carrots. Seriously, how lame does that sandwich sound now? Got a leftover pie crust or two… or enough butter to pump out a few more? You could make a perfect turkey pot pie, crammed full of all your favorite fixings. This one, for example, will use up your leftover green bean casserole, too. Want something a bit more handheld? Check out this recipe for “pocket” pies, stuffed with cranberry sauce, sweet and mashed potatoes, stuffing and, of course, turkey. Make them ahead of time and pop ‘em in the toaster oven to bring your kids a fresh Thanksgiving bite for lunch every day this weekend! I mean, if you take literally anything and add cheese, you pretty much can’t go wrong. This one calls for brie and cranberry chutney, and I am officially drooling on my desk. Don’t overlook this time-honored classic; it earned that status for a reason! Casseroles are cheap, filling and delicious, not to mention a great way to get those leftovers into hungry tummies. There are tons of ways to make your Thanksgiving leftovers into a casserole, but this recipe looks particularly good — and calls for canned soups and frozen peas, which you probably already have at your disposal. First things first: If you’re not making fresh turkey stock with that picked-clean carcass, you’re doing it wrong. Depending on its eventual use, turkey stock recipes vary… but the basic recipe is just that: basic. Throw some root veggies, spices and what’s left of the bird in a pot, cover with water and simmer as long as you can stand it — it’s going to smell incredible. (This recipe says two to three hours, but I’ve gone as long as six, adding extra water as needed). Then, make that stock into delicious soups! 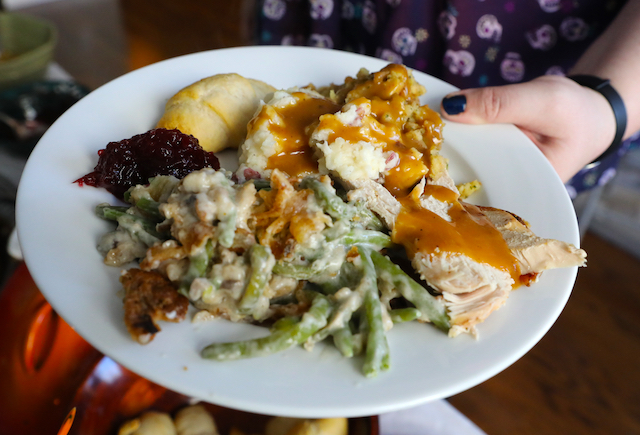 This is a common Thanksgiving tradition, so you have tons of varieties to choose from. Might I suggest Alton Brown’s super-simple “bird to the last drop” or this kale-and-white-bean version from Whole Living? Finally, we’re thrilled to share this recipe for turkey porridge, courtesy of Rissti Rusdhiana, the wife of TPH assistant editor Justin Cupler. The toppings, like salted radish and sweet soy sauce, are optional (and available at your local Asian market) — but sure to put an international spin on an American classic. Sautee the garlic in a bit of olive oil to release its flavor. Then, place all the ingredients (except the optional toppings) into the crock pot and cook on low for six to eight hours. It’s as easy as that: Serve in a bowl, add your preferred toppings and enjoy! I get it. Some things are traditional for a reason. But after your obligatory Wonder-bread-and-Hellman’s version, consider elevating your turkey sandwich game with the following creative recipes. This Thanksgiving leftovers club sandwich stacks everything that was on your plate between three layers of dinner rolls. Martha Stewart suggests three sandwich variants to use up your bird: the turkey and onion (which looks way better than it sounds), the turkey cobb, and the turkey, cheddar and green apple. Food Network chef Tyler Florence’s turkey sandwich calls for apple butter and brie (swoon) — and I have a hunch that fresh-carved turkey breast will substitute for deli slices just fine. In the category of foods that make you go, “I made too much of this and I’m not sorry,” mashed potatoes are second only to the turkey itself. And although they’re just as yummy reheated and piled up with gravy the next day, here are some more creative options to play with. Potato pancakes might already be the perfect Penny Hoarder food. They’re delicious, filling, versatile and, of course, inexpensive — especially when you have a ton of leftover mashed potatoes to use up. Food Network Chef Giada De Laurentiis get eggs and parmesan involved in her “eggs in purgatory” dish. Or, you could experiment with throwing additional ingredients right into the mix before cooking. Kelly, who blogs at Just a Taste, wisely suggests cheddar cheese and scallions. But even if you just eat ‘em plain, trust me: You’re gonna have a happy belly. Yes, more soup. Come on, it is the perfect winter food, right? 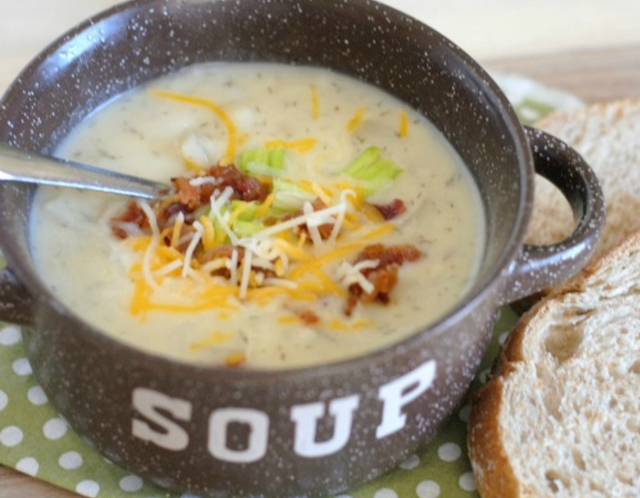 Plus, you’d be hard-pressed to argue against this loaded mashed potato soup from Mommy Hates Cooking. Bonus: Skip the chicken broth and sub in that delicious turkey stock you made. Who knew that if you add an egg to mashed potatoes, they’ll bake into fluffy, delicious muffins? Now promise to use your newfound knowledge for good. Just a Taste’s Kelly offers this crazy-simple recipe for mashed potato muffins, or try Faith’s slightly more involved recipe for mashed potato “puffs,” available at The Kitchn. By the way, when I say “involved,” I mean “there is a lot of cheese and bacon in it.” So it’s definitely the good kind of involved. 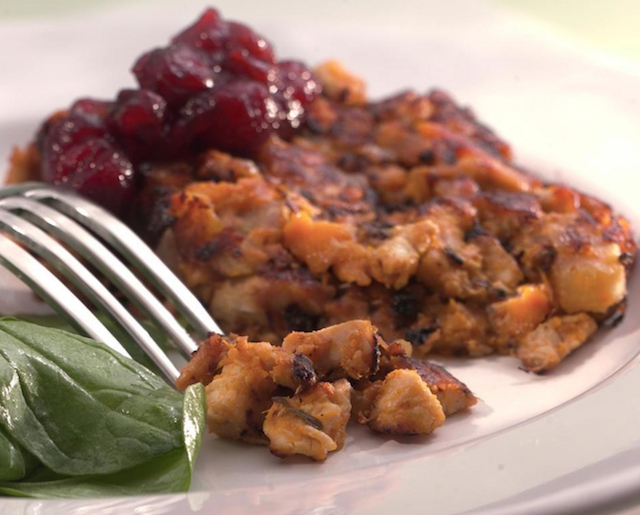 Want a quick and easy way to use up your turkey meat, mashed potatoes and leftover cranberry sauce all in one go? Check out Martha Stewart’s recipe for turkey croquettes. They’re deep-fried, so we’re betting you can substitute more cost-effective dried herbs for fresh. Don’t worry, no one will tell Martha. Already used up your turkey in one of the scrumptious recipes above? John Torode’s “bubble and squeak” croquettes call for bacon, turnips and cabbage for a total repackaging of a Thanksgiving fave. 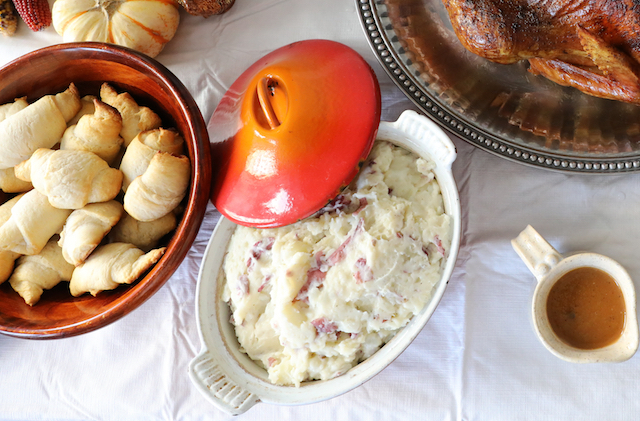 Bet you didn’t know mashed potatoes could have a place on the dessert table. This lemon drizzle cake ditches flour in favor of ground almonds and — you guessed it — mashed potatoes to stay fluffy and flavorful, even though it’s gluten-free. Told you we were gonna get creative. It’s kind of a rarity to have any of this left, at least in my house. That said, if you do have leftover stuffing, you’re in for a treat. As soon as I saw this recipe, I knew I was in trouble. 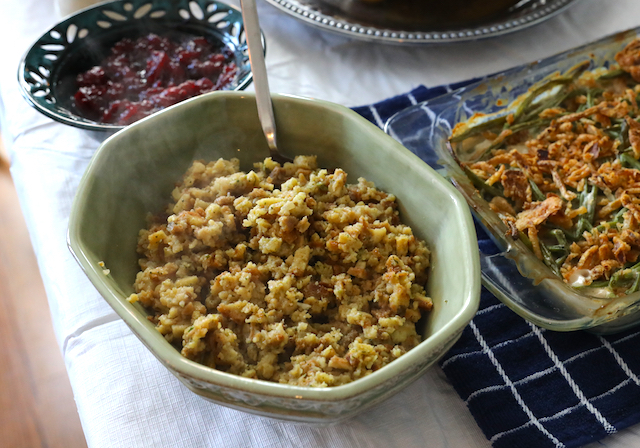 I know everyone says this, but my mom’s stuffing is the actual best in the world. As proof, I offer the fact that it includes an entire pound of hot breakfast sausage and a full loaf of slightly-stale white bread. Basically, there’s no way I’m getting through the holidays without deep-frying bites of those babies and dredging them through cranberry sauce. Stuffing inception: Way more delicious than the movie, even though there’s less Leonardo DiCaprio. This Food Network recipe is super-simple and looks crazy tasty. Do yourself a favor and spring for fresh parmesan — the stuff in the green cardboard tube has no place on a dish this good-looking. It’s not often you get to have what’s basically dessert on your actual dinner plate. And I know it’s one of my favorite Thanksgiving elements: sweet but tangy, and a perfect compliment to that overzealous mound of other savory dishes. But shockingly, many people eat only a tiny bit of cranberry sauce, or consider it merely obligatory. Which is maybe lucky for you, considering these recipes for its leftovers. 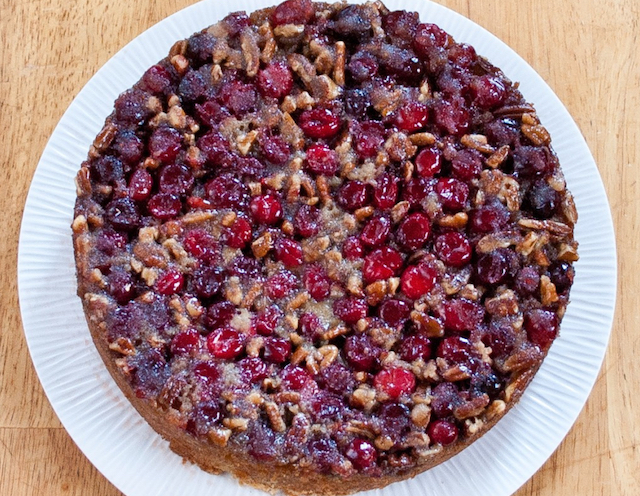 Last winter, I made a cranberry-pecan upside-down cake and took it to the hotel where my parents were staying in town. We ended up sharing it with three or four people at the hotel bar, whose holiday spirit — and smiles — grew with each ensuing bite. I can’t find the recipe I used (drats! ), but this version from Baked In’s Julie looks, admittedly, way better than mine did. Just substitute your sauce for the fresh cranberries it calls for — or use that leftover bag that didn’t make it to your table in the first place. 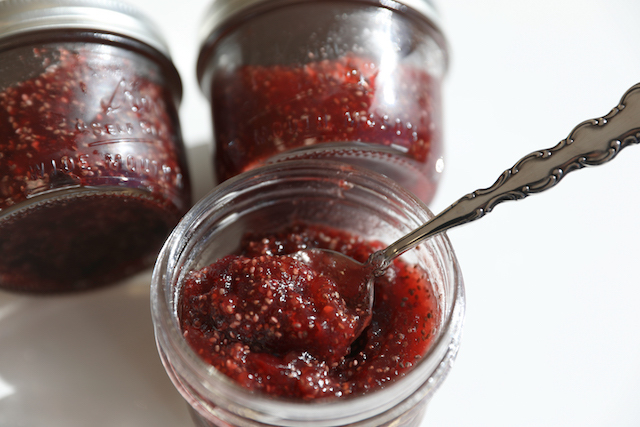 TPH office superhero Jaimee Tyree made a delicious breakfast or snack item that couldn’t be simpler: She simply added a couple of tablespoons of chia seeds to a cup of cranberry sauce, half jellied and half chunky. The result? A delicious, fruity pudding the office blew through so quickly, we almost didn’t have time to snap a photo. Calling for little more than dough, an egg and some sugar, these cranberry tartlets are as elegant-looking as they are delicious, and make a great relief from heavier, custard-based desserts like pumpkin pie. 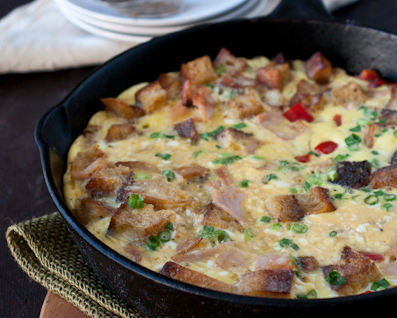 Thanksgiving leftovers for breakfast doesn’t have to mean hash — not that it’s a bad option! Consider spooning your cranberry sauce into pancake batter for a sweet breakfast that might become your new favorite Friday-after-Thanksgiving tradition. 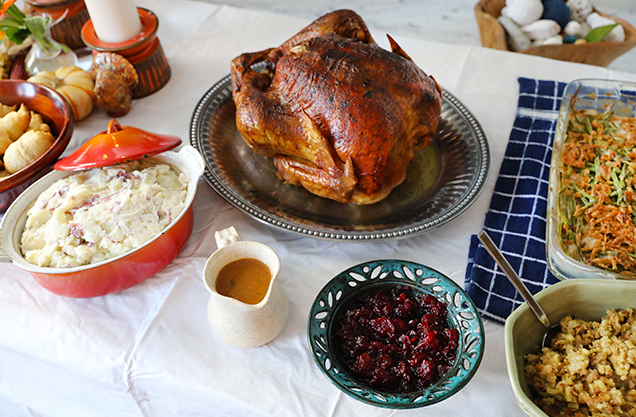 Want to transform that cranberry sauce into next week’s breakfast for the whole family? Whip up a batch of muffins! This recipe from Kitchen Treaty’s Kare looks delectable, as does Wes Martin’s cranberry-carrot version. And hey, you’ll get a serving of fruits and vegetables in each one! Honestly, we didn’t find a whole lot of ways to repurpose this one — probably because it’s so darn good just reheated and eaten as-is. But aside from spooning it onto salads (or simply into your mouth) try this easy way to use up your green bean casserole. This quiche has nine ingredients, one of which is your leftover greenbean casserole — and two of which are cheese. That’s the kind of math I’m happy to do, English major or no. Whether you sweeten your dinner with candied yams or opt for a savory dish, this spud probably has a place at your Thanksgiving table. Here’s what to do with the leftovers. This suggestion comes straight from our CEO, Kyle Taylor. “I always make a breakfast hash with leftover sweet potatoes, turkey and poached eggs,” he wrote in a Slack message. I always knew that man was brilliant. I’m sure any hash with those ingredients would come out spectacularly, even if you just threw everything at the pan. But if you’re looking for a more structured recipe to follow, consider this version from Jan’s Sushi Bar, which incorporates kale and bacon fat (yum), or EatingWell’s lightened-up hash, which brings in an apple to balance the mix. Want a slightly sweetened roll to go with your Saturday dinner, once all the Thanksgiving crescents have been eaten up? Try out Angela’s sweet potato biscuits, courtesy of Spinach Tiger — and be sure to click through to her original recipe for candied sweet potatoes, too. I know I’ll be trying that recipe for my next big holiday meal! Transforming your yams into a sweet potato pie is pretty much as simple as adding crust — and some evaporated milk or eggs to get the pie’s texture right. Here’s one more way to make those sweet potatoes even sweeter: Transform them into cake! This recipe looks reminiscent of good, homemade gingerbread. 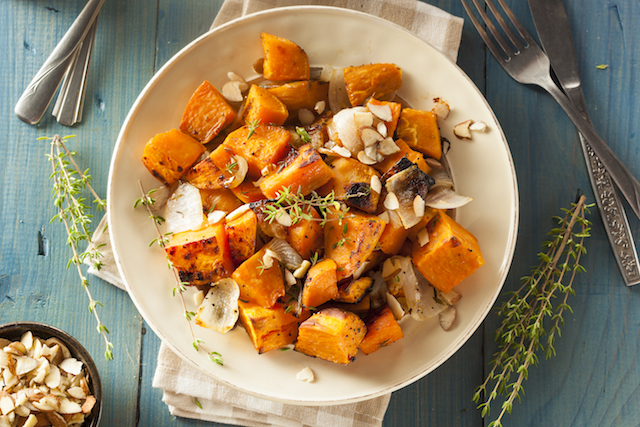 Be sure to adjust the amount of sugar you add to the mix depending on how much sweetness is already in your yams! Your Turn: What’s your favorite creative way to use up Thanksgiving leftovers?